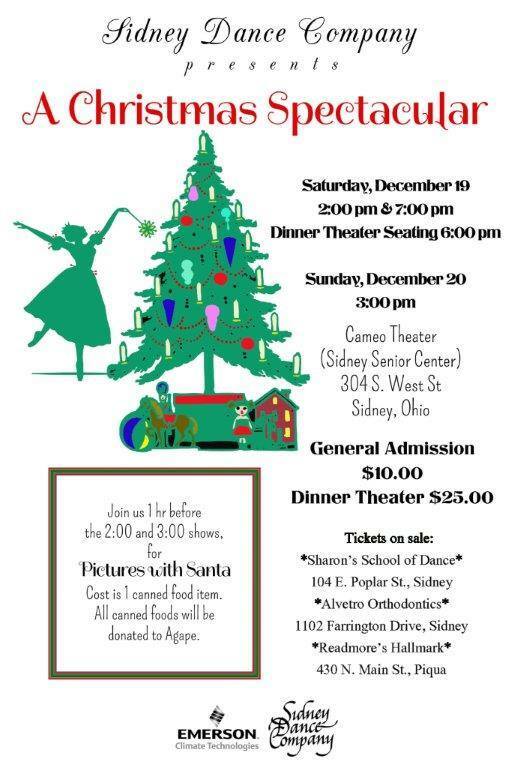 Come celebrate Christmas as the Sidney Dance Company presents A Christmas Spectacular a holiday variety show at the Cameo Theater in Sidney, OH on Saturday, December 19, 2015 at 2pm and Sunday, December 20, 2015 at 3pm. Admission is $10. Bring a canned good and arrive one hour before the shows to have pictures taken with Santa! A special dinner show will be presented on Saturday, December 19 at 7pm. A buffet dinner will be provided at 6pm. Dinner theater price is $25 and general admission (no dinner) is $10. Santa will not be at the dinner show. Tickets now available at Sharon’s School of Dance, Alvetro Orthodontics and Readmore’s Hallmark in Piqua! This entry was posted on December 8, 2015 by Stephen. It was filed under Shows and was tagged with Ballet, Christmas, dance, dinner, SDC, variety show.